Hopefully, you took advantage of the AccuQuilt sale. These tips were written for embroidering applique shapes cut with AccuQuilt dies, but are just as valuable if you tack and trim your applique designs by hand. 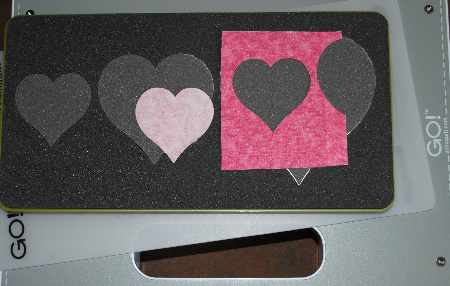 Great news- Ann has added the AccuQuilt 2-3-4" heart die to their inventory! I have posted several articles using that die. The heart projects could be easily adapted to bridal shower and wedding favors or decorations. Super quick and easy, just add a monogram for the new bride or couple. If you have ever used scrapbook dies, they cut paper cleanly and without distortion. Fabric, on the other hand, has a grain. Keeping the die lined up with the length-wise grain helps avoid stretching and pulling that can distort the cut fabric. If you are unsure about fabric grain, particularly when cutting small fabric scraps, pull the fabric north and south, then east and west. One direction will stretch more than the other. The one that stretches is the bias and, although it is preferable when making binding strips, you don't want to cut applique shapes on the bias. They will either lay too far inside the placement lines to be tacked down properly or they will be larger than the placement lines and hang out beyond the finishing satin stitches. Using spray starch on fabric before cutting helps to keep applique pieces crisp. They cut well and stitch beautifully when taut. This double-sided magic not only helps hold the shape of the applique being cut, it also can be used to fuse appliques to base fabrics. Be sure to read the instructions before applying fusible web as it varies by manufacturer. Apply it to the scrap and lay the scrap over the die before cutting. When securing fusible applique in the hoop, it is nearly impossible to use a standard iron. A wonderful tool is the mini iron, a small iron on a wand that can be used to tack down the applique to the base fabric. Once secure, finish the tack-down, trim, and satin stitches. Press well after removing from the hoop. Fusible interfacing is another good way to stabilize applique fabrics. Be sure to use a thin and flexible variety for a soft appearance. Unlike fusible web, interfacing allows the applique to "float" over the base fabric rather. Is an AccuQuilt Baby or GO! machine really necessary? No, but it is like using a spoon to cut out sugar cookies. Sure, a spoon will work but, if you use a cookie cutter, it is much easier (and prettier). The dies cut fabric shapes with little effort and great precision. Better yet, there is an ever-expanding source of embroidery designs available for many AccuQuilt shapes. Check back; a future post will show easy digitizing for AccuQuilt applique.